This blender guide is for anyone looking for the best cheap blender (that actually works well) as I realize that not everyone can afford a $400+ high-speed blender. Continually updated for 2019. A couple things to consider before choosing a blender just based on price. Consider the blender pitcher size vs blender motor when comparing blenders. There are many inexpensive blender with large pitchers but they have motors that are not powerful enough to blend that much volume. This results in either burning out your motor or drinking smoothies with chunks in it. I only included blenders below that have decent motor strength for the price and capacity. Frequency of Use. If you are going to be using the blender daily then I would pay up a little more to get the next level blender because it will last longer. Too many people burnout their cheap blenders and keep buying new cheap blenders over and over rather than just buying a good blender that will last for many years. What will you be blending. If you just want a blender to make milkshakes, simple smoothies and occasional frozen drinks then most blenders should be fine. If you plan on making green smoothies with tougher ingredients like nuts, kale, or broccoli then it is worth getting a blender with the power to properly handle those ingredients. If you will be doing horsepower-intensive blending tasks like milling flour, hard nut butters, and pureeing raw vegetables then you will want to pay up for a blender that won’t burn out on you in the first six months. I considered all of the criteria listed above when selecting the blenders in this budget blender guide. 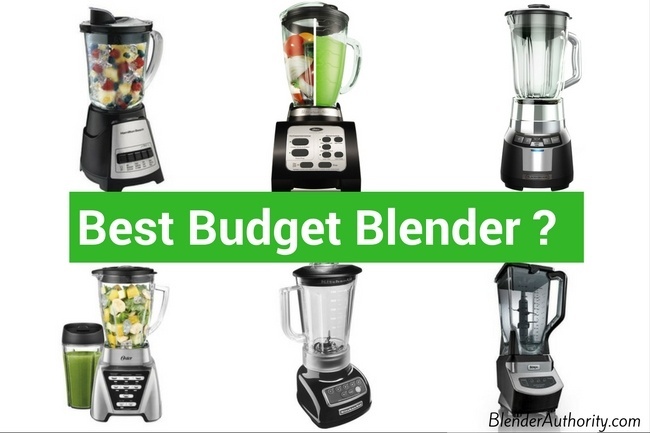 These are the best budget blenders that perform well and provide good value for the money. There are a lot of blenders under $100 so I have narrowed it down to the models that performed the best in tests and that have continued to be best sellers. I reviewed the lesser priced Oster BRLY07-B below and the Oster Pro 1200 is a very solid upgrade with a powerful 1200 watt motor(900 watts when you crush ice) and extra 24oz smoothie cup. The Oster Pro 1200 comes with both a large 6-cup capacity blending pitcher and a separate 24oz smoothie cup. It has seven speed settings: 1) Green/frozen smoothies 2)Food chop/salsa 3)Milkshakes 4)low 5)medium 6)high, and 7)pulse. The three pre-programmed functions are: food chop/salsa, milkshakes, and green/frozen smoothies. The blender comes with a three warranty and a ten year warranty for the metal drive. The blender’s six-cup glass container is well built and tested to withstand thermal shock. Positives: Excellent blending power and I really like the extra 24oz personal-size smoothie cup so you can make large or small batches. The large 3.5 inch blade that gives the user more reach for better blending. I like the 3 year warranty that Oster provides(vs most blenders in this price range are 1 year). Customers really love the glass jar even though it is somewhat heavy. Consumer Reports tested the Oster Pro blender and said it was “very good in overall performance”. Negatives: The glass jar is heavy. While the Oster 1200 can blend well, it might struggle with tasks like making nut butter. Overall Opinion: The Oster Pro 1200 blender has a lot to offer for its price with strong power, quality metal driveshaft, and excellent warranty. It competes well with the Ninja NJ600 that I reviewed above but the Oster 1200 has more power and features with better warranty than the Ninja. The Ninja BL610 is part of the Ninja Professional blender product line. Ninja has a lot of blender models and the BL610 is one of these best selling blender models EVER. It offers a powerful 1000 watt motor and 72oz XL blending pitcher. The unique feature of the Ninja BL610 is the “Total Crushing Blade” which is a unique design that features a shaft up the middle of the pitcher with multiple levels of blades. It is designed to be able to move the ingredients around better so it doesn’t get stuck in the bottom and works especially well at crushing ice. Easy to operate controls and comes with 3 speeds as well as a pulse button. There are multiple models within the Ninja professional line and the BL610 is the lowest priced model in the series. 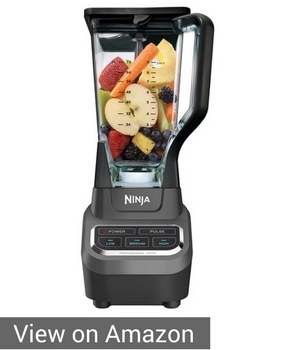 With a 1000 watts, the Ninja BL610 can perform all the key tasks that you expect with a powerful blender. It won’t create the puree consistency of a $400 Vitamix blender but this Ninja does a good job. Positives: Good performance for the price. One of the highest rated blenders with thousands of reviews. Has a good balance of power and capacity that allows it to crush ice, blend, make salsa, nut butters, and more. Overall Opinion: As mentioned in my Ninja blender guide, the BL610 is the best priced model in the Professional blender series and continues to be a top seller. It offers excellent blending power and capacity for the price and does well at making smoothies. America’s Test Kitchen had good results making smoothies with this blender and the only complaint with the blender is what I mentioned in the “Negatives” section above. The Ninja is a good blender but we gave a slight edge in rankings to the Oster 1200 above due to quality and consistent blending results. The Hamilton Beach Power Elite 58148A does surprisingly well for its low price tag and is a top pick for cheap blenders. It is simple to operate blender with push button controls and no electronic blending programs to worry about breaking. 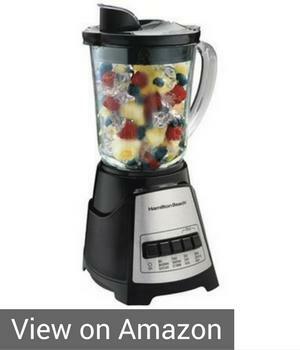 This blender comes with a 700watt motor and a 40oz pitcher. The motor strength is decent for the price and blender tests showed it performed decent for smoothies, crushing ice, and simple blending tasks. The simple controls include 12 blending functions in total; Mix, Milkshake, Easy Clean, Puree, Smoothie, Icy Drink, Chop, Dice, Salsa, Grind, Crush Ice, and Grate. 3. It comes with Hamilton Beach’s “Wave action system” which is their method for blending the ingredients more thoroughly. A unique feature of this blender is that it comes with a thermal shock-tested glass container whereas many blenders nowadays use plastic jars. The positive of the glass jar is that it is dishwasher safe and doesn’t stain easily. The downside of having a glass jar is that it is heavy. Positives: The Hamilton Beach Power Elite Blender is the best affordable blender especially with a 3 year warranty (Most cheap blenders only have a 1 year warranty). 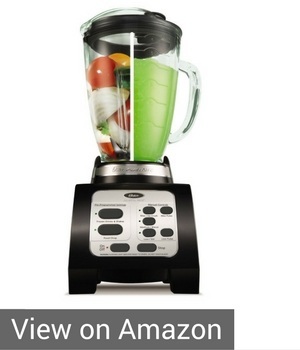 There are over 4,000 user reviews on this blender and the feedback is pretty good about its blending abilities. It is a nice size at only 14.7inches tall and comes with an easy to clean glass pitcher. Negatives: It will struggle a little at pureeing difficult ingredients like broccoli and fibrous kale. It might not handle larger quantities of drink to perfect consistency every time so you might have to help it along or blend longer. Not intended for difficult blending tasks like making thick nut butters, milling flours, and chopping hard vegetables. It might not last as long as more powerful(more expensive) blenders. Overall Opinion: There are a series of comparable Hamilton Beach blenders in this price range and the Hamilton Beach 58148A blender is the most popular among them and rates as the our best blender under 50 dollars. (CNET tested and liked the similar priced Hamilton Beach Smoothie Smart Blender which is another top seller but the Hamilton Beach 58148A Power Elite is a better seller and both models have the same strength motor). In summary, the Hamilton Beach Power Elite blender won’t blend as well as a higher priced Vitamix or Ninja blender but for the price you can’t complain. I am pretty impressed it comes with a 3 year warranty and glass jar. I like the simple controls and size of this blender. It is terrific blender for simple smoothies, protein shakes, and general usage. As long as you don’t overwork this blender and use enough liquid when blending to reduce friction then it should perform fine. It might take a little longer blender time to handle more difficult ingredients. The Oster BRLY07-B is a good inexpensive blender from a well-known blender brand. This 600-watt blender has really unique features among blender in this price range with dual direction blending, all metal drive shaft, programmed blending, and 3 year satisfaction guarantee. Also, it was uniquely designed to double as both a blender and basic food processor with its blade design and pre-programmed settings. This blender has more technology and features than the Hamilton Beach blender that I reviewed above and is a great value for its features. The Oster BRLY07-B has pre-programmed settings that automatically stop when blending is complete. It has multiple speeds with one-touch pre-programs for making frozen drinks and food chopping. It has 5 manual controls for crushing ice(high), blending(Medium), stirring(low), max pulse, and low pulse. Good Housekeeping tested this Oster blender a while back and found that it performed very well at making smoothies and grinding coffee beans, but struggled a little with frozen drinks and some vegetable chopping. 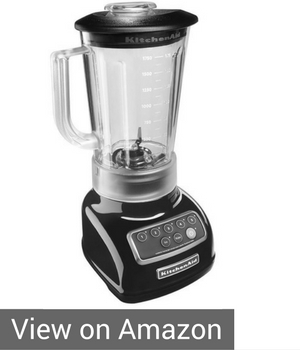 Positives: I really like the all-metal drive shaft and variety of speeds of this blender. The reversible blade technology is a neat feature so that ingredients don’t get clogged up in the blades. The blade design works well for crushing ice and making smoothies. It has a very nice 40oz glass pitcher that is easy to clean and dishwasher safe. Good Guarantee: Comes with a 10 year all-metal drive limited warranty and a 3 year satisfaction guarantee. Negatives: This blender is marketed as a blender and food processor but I couldn’t find much feedback on how it performs in food processing. Good Housekeeping said it didn’t chop onions well but users have positive feedback about food processing. There are some comments about it being loud. It starts out blending at 1000 watts and then drops down to continuously blend at 600 watts which seems to do a good job for blending but might not puree more difficult ingredients. Overall Opinion: It is a good inexpensive blender and I am surprised it isn’t more popular for the features it offers. With the quality of a all-metal drive shaft and programmed settings it is a great choice. It might not do perfectly at chopping vegetables and some food prep activities but for making smoothies and blending this is a really good blender from a reputable blender brand. It has been on the market since 2007 so you can read some honest feedback from users who have used this blender for a while. A neat feature I found out about Oster BLRY07 blender is that you can use a regular mason jar instead of a blender jar if you wanted to blend a small batch directly in the mason jar. The KitchenAid 1570OB is a classic countertop blender with a variety of speeds and a “Intelli-Speed” Motor control that senses the ingredients for optimal blending. Popular consumer test site TheSweetHome chose this KitchenAid blender as its top budget pick. Although, they were comparing it to performance of higher-priced blenders like Vitamix and Blendtec and not necessarily to other blenders in this price range. The KitchenAid KSB1570OB only has 650 watts so it wont puree to the consistency of higher powered blenders but it does perform well and has a nice solid feel to it. This blender has 5 speeds plus buttons for Crushing Ice and Pulsing. I like the variable speed pulse feature. It comes with a 56oz BPA free pitcher and solid steel reinforced drive train for durability. Positives: The KitchenAid KSB1570OB 5-speed blender is a traditional countertop blender with nice design and features. 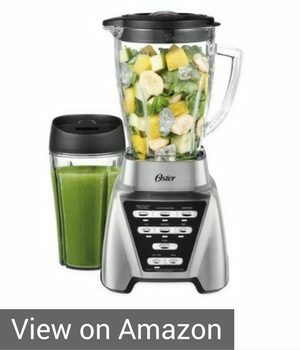 It has very good customer reviews and tests found it performed pretty well for a blender in this price range and motor strength. Among the different Kitchenaid blenders, this one is well priced for what it offers. Negatives: Despite having a large 56oz pitcher, the 650watt motor is going to struggle blending that large of a capacity when filled. Overall Opinion: I like the look of the KitchenAid 1570OB and is a decent blender with Kitchenaid quality. It is not as powerful as the Ninja or Oster blenders I listed above so it won’t blend as well but it should do OK for occasional use. If you like Kitchenaid brand then this is good choice for under $100 and it will last. Personally, I would go with the Ninja if you want more power for less price or the Oster which has more power, good reliability and nice features for about the same price as the Kitchenaid 5-speed 1570OB. The final blender in my list of best inexpensive blenders is the Black and Decker BL1820SG-P. 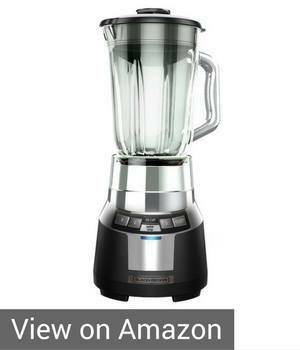 I simply added this because Consumer Reports chose this model as their best bargain blender in their testing. The Black and Deck Fusion Blade blender provides 700 watts of power and comes with a 48oz glass jar and 20oz personal jar. The BL1820SG-P model comes in red or black with a removable blade and easy to use touchpad controls. Positives: It was chosen by Consumer Reports which is known for its extensive product testing. It offers decent power with nice features. Negatives: I researched a lot of reviews on this model and there is more dissatisfaction with this blender than the other two blenders I reviews above. The complaints were about it breaking in a short period of time and that it didn’t blend very well. Overall Opinion: I only included this model because it was Consumer Reports choice for budget blender but the user reviews had been mixed on this blender and I feel you would be better off choosing one of the two blenders listed in the above category or paying a little more for one of the blenders in the category below. Ninja Master Prep (QB900B): A popular all-in-one blender and food processor that has very strong reviews(almost 10,000 reviews). It almost made my list of top blenders under $50 but it really is more for food processing that also happens to blend. (Works great at crushing up ice). Take a look at how the Ninja Master Prep (QB900B) works and maybe it is a fit for you, but I wanted to focus this guide on best cheap countertop blenders. Shred Emulsifier Multi-Functional Ultimate 1500w 5-in-1 Blender : This blender is powerful for the price and was marketed on TV. It has a lot of power and features for the price. It was created by popular health author Dr Ian Smith but my research found that this blender doesn’t last very long. Initially it works but I found numerous users who experienced malfunctions and motors failing within the first year with only occasional use. I have reviewed quite a few blenders and have read probably every blender test out there in my search for the best affordable blender. I also go though lots of customer reviews and user feedback when selecting blenders that I like. The models that I included in this article are what I feel are the best inexpensive blenders for the money and performance. Realize though that you can only expect a certain level of performance and quality for cheap blenders, but if you use the blender properly(such as using enough liquid to blend) then the blenders in this guide should meet your needs. Also, I only discussed countertop blenders in this article but if you are considering a compact blender then read my article that compares Ninja and Nutribullet which are the two most popular compact blender brands. If you have any questions about these blenders or even a cheap blender model that I didn’t include, then please comment below. shipping carrier can pick from you and ship directly to me here in Fiji. Hello Phillip. We don’t sell the products directly. You can contact Nutribullet directly and see if they deliver to Fiji. Otherwise, try Ebay and find sellers that will ship internationally.